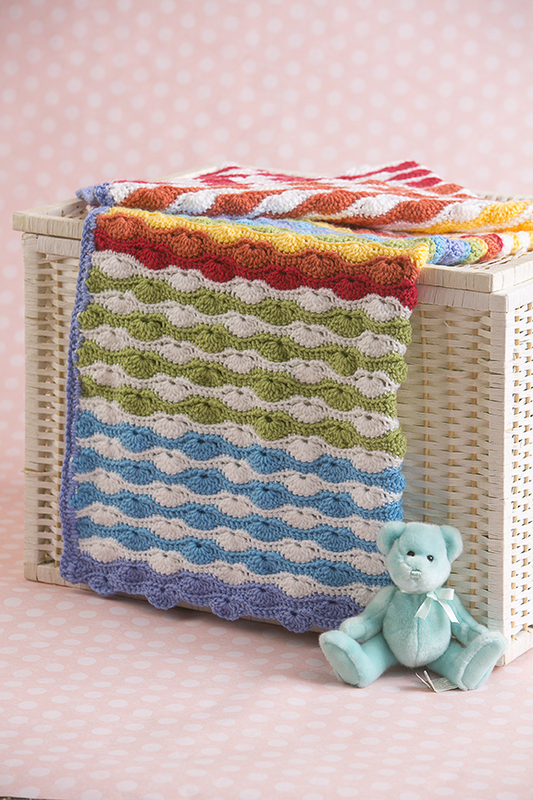 This vibrant and colorful baby blanket makes a great gift. Plan out your colors or use scrap yarn to create a unique variation. Foundation Row (RS): Turn, sk 2 ch (counts as first dc), 3 dc in next ch, *sk 3 ch, sc in ea of next 7 ch, sk 3 ch,** 7 dc in next ch, rep from * across, ending last rep at ** with 1 ch remaining, 4 dc in last ch. Row 1: Turn, ch 1, sc in first st and ea st across, including top of t-ch. Row 2: Turn, ch 1, sc in first st and ea of next 3 sts, *sk 3 sts, 7 dc in next st, sk 3 sts,** sc in ea of next 7 sts, rep from * across, ending last rep at ** with 4 sts remaining, sc in ea of last 4 sts. Row 3: Rep Row 1. Row 4: Turn, ch 3 (counts as first dc), 3 dc in same st, *sk 3 sts, sc in ea of next 7 sts, sk 3 sts,** 7 dc in next st, rep from * across, ending last rep at ** with 1 sts remaining, 4 dc in last st.
Change color in last yo of final stitch of row. Carry yarn up side in Rows 1-48 and 73- and do not fasten off. 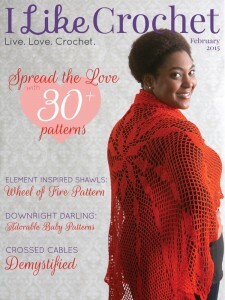 Entire pattern is worked by crocheting in the front loop only. With CA, ch 143. 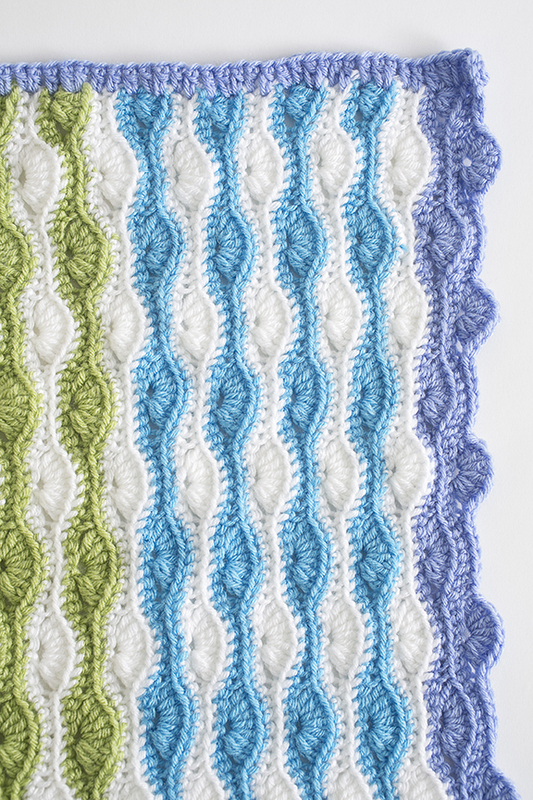 Begin Wavy Shell Stitch pattern by crocheting Foundation Row. Rows 1-16: [Rows 1-2 in CB, Rows 3-4 in CA] 4 times. Rows 17-32: [Rows 1-2 in CC, Rows 3-4 in CA] 4 times. Rows 33-48: [Rows 1-2 in CD, Rows 3-4 in CA] 4 times. Rows 49-58: Rows 1-2 in CB, Rows 3-4 in CC, Rows 1-2 in CD, Rows 3-4 in CE, Rows 1-2 in CF. Rows 59-62: Rows 3-4 in CG, Rows 1-2 in CG. Rows 63-72: Rows 3-4 in CF, Rows 1-2 in CE, Rows 3-4 in CD, Rows 1-2 in CC, Rows 3-4 in CB. Rows 73-88: [Rows 1-2 in CA, Rows 3-4 in CE] 4 times. Rows 89-104: [Rows 1-2 in CA, Rows 3-4 in CF] 4 times. Rows 105-106: Rows 1-2 in CA, fasten off. Rows 107-110: Rows 3-4 in CG, Row 1-2 in CG, do not fasten off. Asymmetrical Edging: Turn to begin working along side, ch 2, dc in side of ea sc and 2 dc in side of ea ch 3 or dc across to end of row. Fasten off. Weave in ends with yarn needle. Spray block if necessary. What’s blocking, and how do you do it?